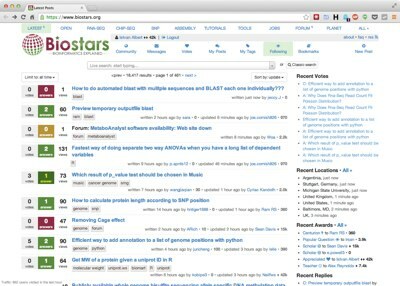 Over the last years Biostar powered sites met the information needs of over three million users and served over six million pageviews. 2008-2011: BooleanNet, a Boolean network simulation software for life sciences . 2006-2011: GeneTrack a bioinformatics software package for storing, querying and visualizing interval oriented data. 2006-2007: MiniDB, a data storage system for microarray research. A collaboration with Frank Pugh ( folded into the Genome Cartography Project). 2004-2011: LionDB Lead developer of LionDB, a laboratory data management system in continuous operation since September, 2004 it served the data exchange needs of the life science researchers at Penn State. 2001-2003: MovieLens I served as lead developer of Movielens between 2001-2003. A movie recommendation site using advanced data mining and novel user interfaces. The site is run by the GroupLens research lab in the Department of Computer Science and Engineering at the University of Minnesota.